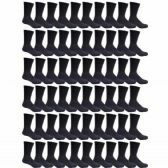 12 Units of Yacht & Smith Unisex Children's Cotton Tube Socks Size 4-6 - Boys Crew Sock at low wholesale prices. alltimetrading.com offers Boys Crew Sock at bulk discounted prices. COTTON TUBE SOCKS: comfortable and soft cotton tube socks for the kids or grand kids. These stylish socks for boys and girls are great for a variety of activities. REFEREE STYLE TUBE SOCKS:. Choose from white black or gray colored socks for children.